Paul Creswell was born in Minnesota, but moved to Madison in the state of Wisconsin, where he’s been living for many years. In a new interview for Vinyl Sphere, Paul admits that growing up in Minnesota and living in Madison had an influence in shaping what is his sophomore studio album, a folk effort titled The Talesman. Eight songs see the musician exploring the art of music creation in both beautiful and dark landscape. Creswell, who is also an avid record collector, answers our questions about the creative process that informed the new album, vinyl, and more. Describe the musical vision propelling your debut album The Talesman. The Talesman is actually my second album. My first was Hopesick in 2012. But it has been a while! Musically, I wanted acoustic guitar and lyrics at the core of this new album. But I also wanted to flesh-out the songs more than on my last one. So, there’s a lot more instruments and textures — piano, drums, bass, harmonies, e-bow, harmonica, etc. Particularly on the b-side of the LP. It just felt right. I started recording it in fall of 2016 and I was happy to be able to release it this fall. The time of year fed into the dark themes. The whole project is a bit like stories by firelight. I wanted it to be a combination of spooky and gezellig. The album cover was designed by a local artist named Rhea Ewing (rheaewing.com). They worked with my song lyrics to come up with an idea. The one we chose was based on the lyrics to “Mississippi Farewell”. You see a hand in some foliage — plants that are actually found in the Mississippi River — and it is also surrounded by money and campaign posters. The whole thing is sinking into a sort of surreal landscape. I loved how this cover communicated the themes of the record. Rhea’s art is really amazing. It was also important for the cover to make it clear to the audience that the music, like the art, is both beautiful and dark. This is a folk album — but one with a bit of a body count (laughing). What was the creative process for The Talesman like? I wrote these songs over the past few years. I probably wrote 30 songs in that period, but these 8 were my favorite and they fit together around the theme of storytelling and the overall mood. I actually had 10 tacks in the studio. Two got cut in the final master. I think that’s part of making a strong record — trimming the fat up to the very end. I wanted the album to feel seamless and unified. In terms of recording, I did the major tracks at DNA Studios, but many of the piano parts and harmonies I recorded at home. Mark Whitcomb — my producer and engineer — was great to work with. He was very open to helping me merge tracks from various sources. He’s kind of a sonic magician, I think. Speaking of the album’s creative process, provide some insight into it. How did you document the music while it was being formulated? I tend to record a rough cut of a song to get a structure. Then I rehearse it over and over to get the ‘live’ feel. I always want that to be the core of the track. I want my songs to work both in a live setting and on the record — and to feel natural. So, that’s how the writing process goes. Once I get the basic studio tracks down, I tend to work in a similar way with adding more instruments. I listen to the tracks a lot and improvise additional parts. I love what emerges from this process. “Ms. Wilson” is an example where I completely surprised myself — I wrote most of those parts during the recording process. Kind of both, really! I’m meticulous about the core parts and then try to let the additional parts flow more freely. In the end, though, I suppose I’m pretty careful and structured. I think that comes from not having a band. Everything is me, so I have the time to polish every little cornice, so to speak. Did the environment in any way influence the vibe the album transcends? You’re from Minnesota, but you’ve been living in Madison, WI for some time now, yes? Yeah, I think both places influenced it. That’s an interesting question. “Mississippi Farewell” is decidedly Minnesotan. The Mississippi river, interstate 94, and Harriet Island — those are all places from my childhood. Wisconsin brings in some of the north woods and rural influences on “My Brother The Myth”. I live where there are many lakes, so seagulls are a real annoyance (laughing). That’s certainly part of where “Arlo” comes from. There’s a lot of ‘place’ in the record, I think. “The Quisling” is set in a fictitious Dublin. These are all stories with a sort of other-worldly position. A friend of mine called them ‘anachronistic visions’. How do you usually go about creating a new song? The old saying is that it’s one part inspiration and three parts perspiration. That’s true for me. I’m always taking notes and coming up with new ideas. But finding the time to hammer them into shape is the hard part. Very few songs just come out fully formed. It happens, but it’s rare. I usually start with an idea, craft lyrics, and then build an instrumental core with my guitar. Once in a while, the guitar comes first. “Bootstraps” is one of those where the guitar riff started the whole song. Which bands or artists influence your work? I’m a vinyl collector and a crate-digger, so I get into lots of different stuff. Certainly The Waterboys and The Bad Seeds are influences that I hear on this record. Mike Scott and Nick Cave are both great storytellers. Also Americana musicians like Bill Camplin, Peter Mulvey, and Kris Kristofferson are big influences of mine. You probably won’t recognize it on the record, but I’m really a huge Prince fan. They actually issue “Purple Rain” with birth certificates in Minnesota (laughing). I love progressive rock too. Opeth, Wobbler, and Yes are favorites of mine. I think my choices for chord-voicing come from prog a lot. Love & Rockets and Bauhaus are in there. I love the atmosphere Daniel Ash added to their recordings. I tried to do some of that on The Talesman. The two records I listened to the most over the last year were Milk Teeth by Crayonsmith and Guggenheim’s self-titled album from 1972. Those are both great records! I can only hope they had some added influence on this album. Hard to say. I think my life has been shaped for the better by all the music I’ve listened to. I think songs make you open to ideas and that’s a good thing. But I think trying too hard to serve a purpose can be a disservice to songwriting. No one wants to be preached at, for instance. I try to be subtle in my preaching (laughing). But, yeah, I think there are things in my music that should make people think about the world and their place in it. I’m definitely concerned about things like politics and environmental degradation — those themes are there. In the end, though, entertainment is my main goal. 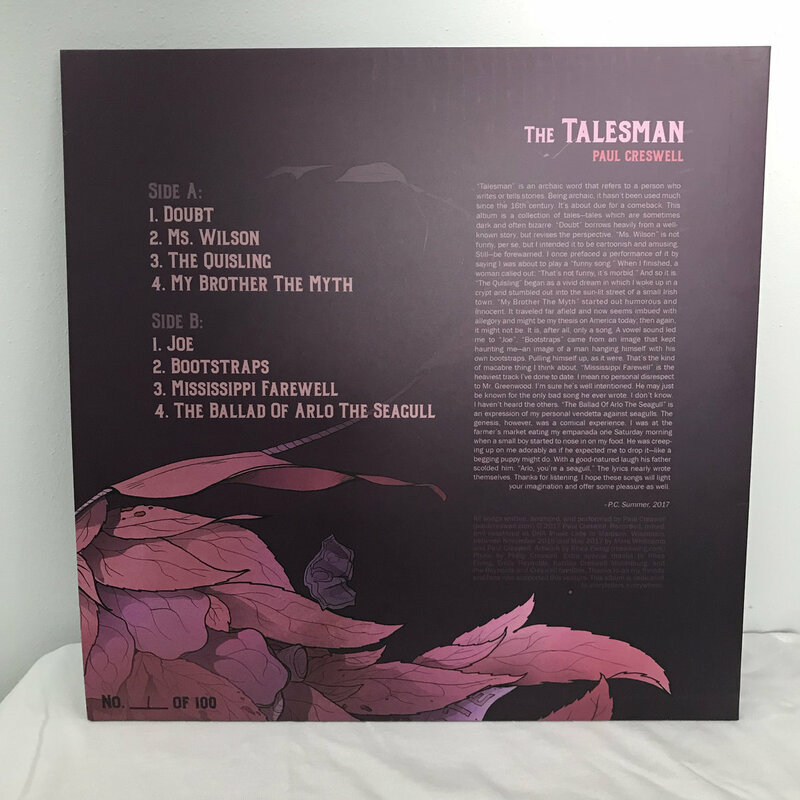 The Talesman is available as a digital download, a CD and also as vinyl. What in particular made you gravitate towards LP? I love records. My first word may have been “record” (laughing). I couldn’t have been satisfied without an LP edition. I’m glad that people are becoming more interested in vinyl again. The LP actually gives the listener the closest to the studio-quality version of my record too. It was cut using the 24 bit 96k masters. So, it’s the full-range. I only pressed 100 copies and they’re hand-numbered as well. My goal was just to make a high-end edition for those who wanted it — including myself. Mobineko did the pressing, and they did fantastic work. As you mentioned, you also maintain your personal vinyl collection. when did you start collecting vinyl? How large is your collection? Yes, I’ve been collecting since I was a child. My first 45 was The Final Countdown by Europe. I still have it. I still have my first FisherPrice record player too! I have a large collection, but I’m down to about 1,000 LPs these days. I used to have more, but I had to get realistic about space. I actually sold a number of records to finance The Talesman. I’m still always looking, though. You never know what you might find. That’s the fun part. I discovered some of my favorite albums buying old LPs. I remember getting whole catalogs of Depeche Mode, Joni Mitchell, and New Order at garage sales or thrift stores. Used vinyl shaped a lot of my tastes over the years. With the album out, what else do you have in the pipeline? I’m taking a much needed break right now, but I plan to play some gigs in the spring. I’m writing a lot of poetry and I’m definitely starting to think about the next record. I want to learn to play the accordion. 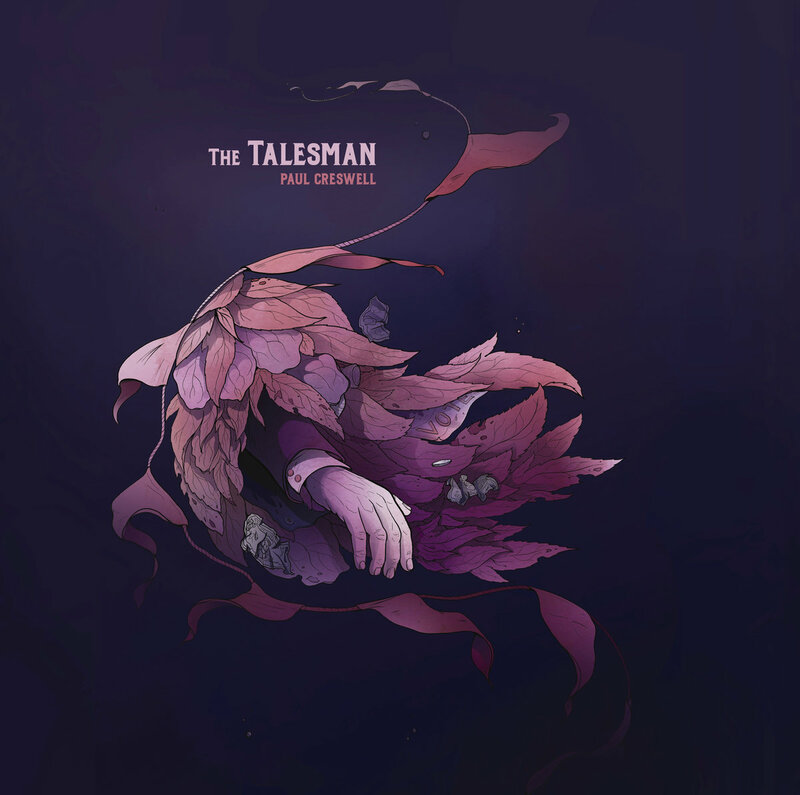 The Talesman is available now; order it from Bandcamp. Visit Paul’s blog here.